Tiki man (tee-kee-man): A tiki man is an ancient god or warrior which represented certain nature forces in the hawaiian culture. The first stone tikis were said to have been carved around the year 1400 in the Marquesas Islands (to-hawaii, 2014). The tiki can take many crafted forms, from giant sculptures of the war God Ku, to images of variant gods carved into drums, boats, or other utilitarian objects, to petroglyphs carved into rock or tattoo patterns on the body. The artistic likenesses created in tikis demonstrate a high level of craftsmanship and perfectionism. 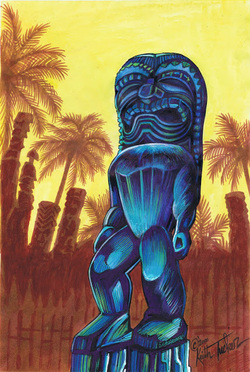 The most recognized tiki character has a strong, stocky body with a rectangular head, seemingly wearing a headdress. This mysterious figure is to a degree an intimidating one, with large eyes and a stance that suggests he is ready for war. The tiki statues were used by pacific islander locals to scare off unexpected and unwanted intruders from entering and potentially harming their territories. Tiki statues are highly respected, still remain within our cultures and used mostly for island decor.